Think, for a moment, about the animals involved with human civilization. For food we keep chickens, cows, goats, pigs, turkeys, sheep, bees, and others. Our pets include cats, dogs, ferrets, goldfish, parakeets, and many more. Then there are the pests that live off us, like bed bugs and lice, and off our crops, like the bollworms, rootworms, aphids, and armyworms. And don’t forget the scores of animals that shadow our homes and cities, taking advantage of byproducts of civilization. These are the rats, cockroaches, mice, and pigeons. The sheer number of animals that have insinuated themselves into our societies is a testament to our enormous global footprint. We must have hundreds of species thriving in our wake. The size of the entourage can be viewed, perhaps, as a measure of our dominance. You might think that we humans are unique in this manner. But we’ve got at least one rival: the swarm-raiding army ant Eciton burchellii. The 557 recorded associates range from birds to insects and mites and comprise the largest described animal association centering around one particular species. At least 300 of the associates are obligate, solely dependent on army ants for their survival. Army ant colonies travel with a veritable bestiary. There are beetles, bristletails, and silverfish that run in the columns, feasting on leftovers. There are mites that ride on the ants- and estimated 20,000 per colony. 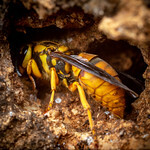 There are birds and parasitic flies that live off the scrambling mass of arthropods spooked up by ant raids. There are scores of arthropods living in the refuse heaps. There are insects that prey on the ants themselves. As a measure of the significance of army ants in tropical forests, it’s hard to beat a pages-long account of species that have evolved to live with Eciton burchellii. In some respects, the swarm-raiding army ants are like humans in the pressures they exert on their environment. For their associates as for ours, adapting to benefit from a dominant species is a good long-term survival strategy. source: Rettenmeyer, C. W., Rettenmeyer, M. E., Joseph, J., Berghoff, S. M. 2010. The largest animal association centered on one species: the army ant Eciton burchellii and its more than 300 associates. Insectes Sociaux online early DOI: 10.1007/s00040-010-0128-8. Why are butterflies so prominent in the graph above? Reading the paper, it seems most of the butterflies are facultative visitors to ant raids. They obtain nutrients from bird droppings. Apparently some species orient to the ants as a reliable source of antbird droppings. 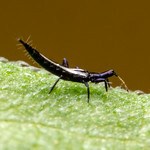 Thanks myrmecos – nice article, although lets hope the Rettenmeyers won’t be the last naturalists. Now I have something to do while waiting for the thermometer to get above -20. After that, I’ll have to leave daydreaming about tropical forests and shovel the snow off the driveway. The foot mite may be Macrocheles rettenmeyeri, or at least that is where they are reputed to hangout. Dave, That is indeed Macrocheles rettenmeyeri, I recognize the slide from working with Carl on his video “Associates of Eciton Burchellii” I believe that he found other species of Macrochelid mites that are yet to be described! I stumbled on this blog by accident while looking for a paper by Carl Rettenmeyer. I had the distinct honor of working with Carl as a field assistant and photographer in Costa Rica and Panama during the filming of his two videos, “Astonishing army ants” and “Associates of eciton burchelli”. Without any doubt working with Carl Rettenmeyer was one of the highlights of my life. Words cannot describe his intense dedication and devotion to army ant research. Often while pondering on the subject of army ants, I find myself wishing I could still call him up and ask questions.